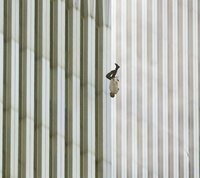 The video is a scan of photographs of more than 2,500 out of the nearly 3,000 people who died on that fateful day in September 2001. Most were in the WTC and were either at impact area or above at the time of the strikes. Around 200 people either jumped out of the windows or were blown out and fell to their deaths hundreds of metres below. All of these people loved their lives, none were expecting to die that day, and certainly not in such a manner. In commemoration of their sad fate I have put together this video so we can all spend 10 minutes thinking about them – and all the innocent victims who have died in the aftermath – and wishing them well in their new lives. Please do the meditation as you watch. The photographs are part of an exhibit in the prosecution case against Zacarias Moussaoui, posted here. Music is the Chant of Metta by Sister Imee Ooi who retains the copyright on the work. Her website is maintained here and the music can be ordered online. In truth, Bhante, I don’t think anyone needs to watch the 9/11 video again. What they need to see is the aftermath, in Iraq, in Afghanistan, in Pakistan and elsewhere. But those images are almost impossible to find. There aren’t videos of what’s happening in the Middle East, of drone flights, of offing civilians and taking fingers as trophies, of torture, of the physical destruction of an entire nation and its history. If 9/11 changed anything, it changed my country. And if we are extending metta, let us not forget the hijackers and Osama Bin Laden. Metta must be universal for noone unenlightened is purely a friend and likewise no one is purely an enemy. I do, of course, agree that what happened next is important and has largely gone unreported. Nearly everything has been seen from the American point-of-view, but there are other views and that’s why I will be showing some alternative documentaries on the situation in the following weeks. The reason for showing the 9/11 documentary yesterday, besides forming the basis for what is to come, is that it carries my own personal story. Also I didn’t mean to exclude anyone from the meditation today, it was simply meant as a reflection on the fragility of life, which, if it were properly acknowledged, would certainly give us a better perspective on the way we choose to live. Bhante, do you think it is meaningful to share metta with the dead? Yes I know of this, but in my experience with doing metta with people for their former relatives I have found that people find it very meaningful. Most people of course when remembering their relatives are not aiming at jhāna, they are simply wishing well to their departed ones. So for me I would rather go with what works than simply what is proscribed in the commentaries. Haunting yet soothing music set to pictures of dearly departed family, friends and strangers; All now aware of each other and of us as One. I wasn’t sure what I was going to see due to the image used as the “cover” for the video, still a beautiful way to remember a not so beautiful memory.